A wonderful flower for attracting hummingbirds to your garden. 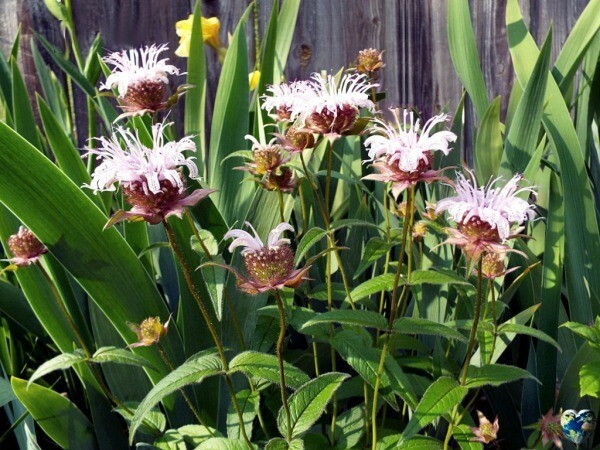 This guide is about growing bee balm. Bergamot is grown for its decorative flowers and aromatic foliage. The plants consist of tubular, crown-like flowers on top of 3 to 4 foot stems with dark green aromatic leaves. Usually bright scarlet in color, the flowers bloom in mid to late summer and also come in salmon, pink, mauve, purple or white, which, along with most gardeners, bees and hummingbirds also find attractive. Bergamot like moist, fertile soil so work plenty of compost into the ground before planting each spring. seeds or cuttings; divide clumps in autumn every two years; named cultivars must be propagated by cuttings or division. use leaves in salads, fruit salads, fruit drinks, teas (flowers), pork and other meat dishes. Editor's Note: This is not the same bergamot as is used in Earl Grey Tea. That flavoring is derived from Bergamot oranges but the scent is very similar. Purchase a young plant or sow seeds directly outdoors two weeks prior to the last spring frost date or in early fall at least two months before the first frost date. Sow seeds 1 inch apart at a depth of 1/8" to 1/16". Start seeds indoors 8-10 weeks before the last spring frost. Thin seedlings to 12" apart. Avoid powdery mildew by keeping good air circulation around plants. 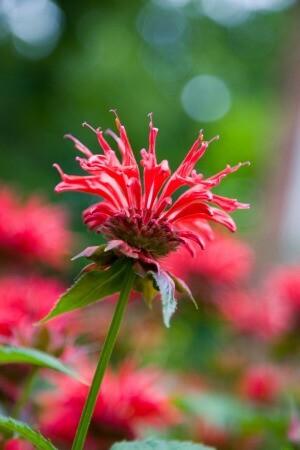 Bee Balm is a must have to attract hummingbirds. Its flower petals can be used to make tea as well as adding color and taste to green salads. Stem leaves can be made into a tincture and used as a bug repellant. 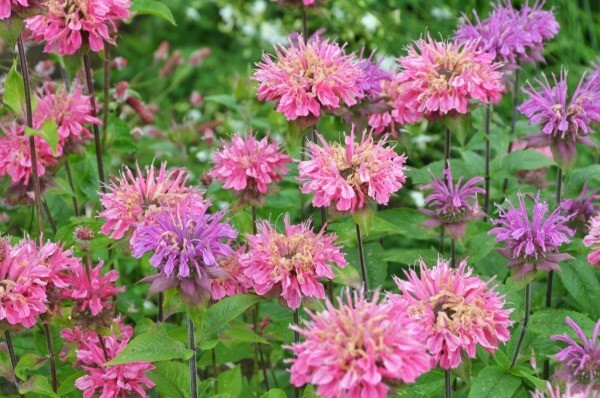 Can I grow Bee Balm in a pot for the first season? I think you can. I grow everything in pots, good luck. Are there seed pods on a bee balm plant and can I start a new plant from them? Thanks. When to Sow Outside: Spring, two weeks before average last frost or late summer/early fall at least 2 months before first fall frost. When to Sow Inside: 8 - 10 weeks before last frost. Seed Depth: 1/8" to 1/16"
Thinning: 12" apart, good luck. 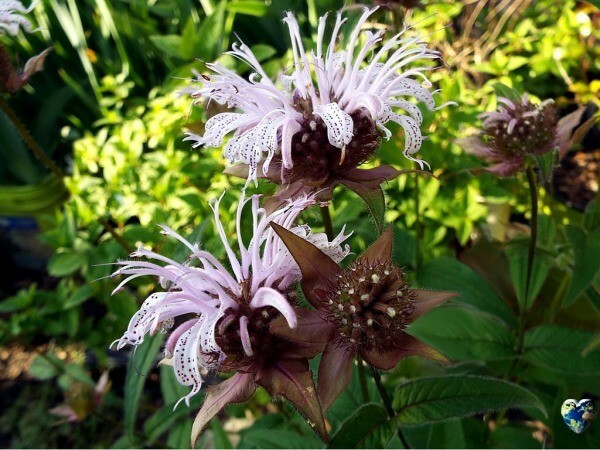 This variety of Monarda has the common name, 'Eastern Bee Balm'. Its typical range covers the central and southeastern U.S. I was fortunate to get these pictures in mid April as its usual bloom time is May. A perennial, it is hardy through zones 5-8. It reaches a height of about 2 ft. The blooms are said to be fragrant. Mine are not. However, the leaves when crushed do have a rather strong medicinal scent. Not unpleasant, though. They will do well in full sun to part shade. Mine are grown in pots above ground. They are thriving and easily withstood a 3 degree night. They are hardy! As you might have guessed, my plants were around $10. I got them at a reduced price of $3. I may not be fortunate about the bloom time, after all. 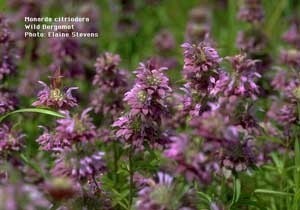 This Monarda is well known to attract butterflies and hummingbirds. Hummingbirds have not migrated to my area, just yet. I fear by the time they do get here, the blooms will be gone. These plants are tough. They are not fussy about soil, they tolerate drought and require little care. Lowe's is sure to have them marked down later this year.